Enjoying a favorable position on the first floor of the hotel with city views, the luxurious Emirates Suite benefits from an abundance of natural light and 120sqm of flexible living, dining, entertainment and working space. Inspired by traditional design from the region, the suite extravagantly appointed with intricately carved wooden furnishings, its sprawling layout carefully arranged to create separate areas for sleeping and relaxation. The lounge area features an oversized sofa and armchairs with footstalls and magazine table, a perfect space to unwind, while an extensive workstation offers an ideal area for guests to work from the privacy of their room. An ornately appointed king size bed guarantees a restful night’s sleep, or simply the most comfortable spot to watch TV. Oversized bathrooms appointed in marble and feature a Jacuzzi bathtub with walk-in shower, twin vanity unit with his and hers sinks a bidet and toilet. The Emirates Suite can accommodate two adults and two children under 12 years in existing bedding. 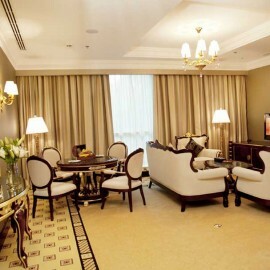 Can connect with one or two Executive Rooms to create either two or three bedroom unit.